IMC of Anthropologie, Burberry + Godiva – Cats, Chocolate + Commas. Anthropologie is a brand that I’ve always loved, but can’t afford. Nonetheless, it’s fun to window shop and browse the website once in a while to see what new products the company has every season. As soon as I went to the homepage, a pop-up window appeared asking me to subscribe to emails. I didn’t because I know I’m never going to buy anything from there, but if I did, I would get pushed an email every day. There are also links at the bottom of the website to sign up for emails and have a catalog sent to you in the mail. 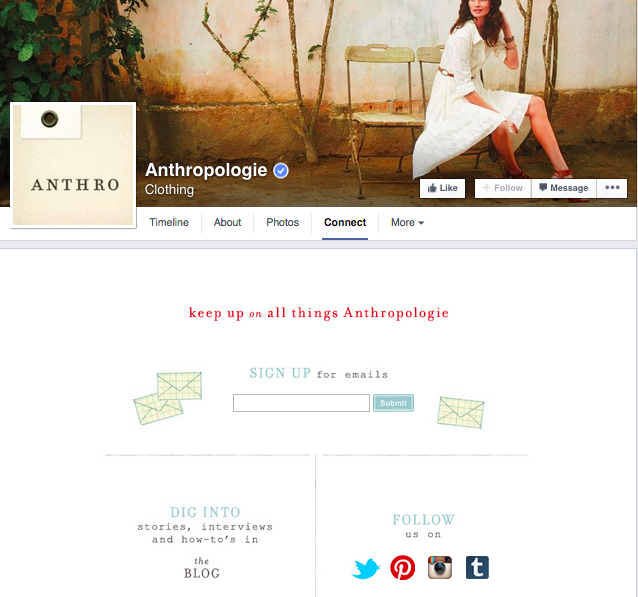 In addition, instead of having the social buttons displayed, there’s a social media link in the footer that you can click on to see Anthropologie’s pages (below). I’m so used to seeing the Facebook or Twitter button so it took me a minute to locate the company’s social media — not sure why this choice was made, but I would suggest clearly displaying the social buttons for ease of access. 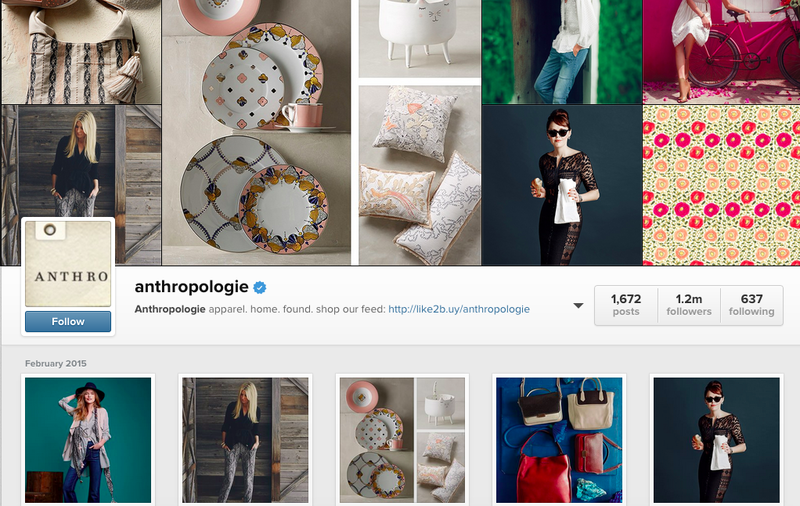 Anthropologie has Facebook, Twitter, Pinterest, YouTube, Instagram, Tumblr, Vimeo and Google+ accounts. They’re very plugged in. On Facebook and Twitter, Anthropologie posts several times a day, featuring different items, sometimes a sale, and, every few days, a blog post with the link. Every Facebook post has the link to the website and every tweet has a link to the website and at least one hashtag. The most notable one being #AnthroPS. The company also retweets others’ posts, meaning it is interacting with other users. The Facebook page is the most extensive I would say in terms of IMC and more. There are links to its other social media pages and blog as well as a place to sign up for emails. You can also watch Anthropologie videos and take a poll, which asks you “which cover would you have chosen for [the] February catalog?” This gets users engaged with the brand and content. I was also very impressed by how responsive the company was to users posting on its wall. The user below was having trouble with the promo code and three hours later, the company responded. I think that’s good customer service. On Instagram, some of the images are the same as the ones found on its Facebook and Twitter pages, but mostly the posts are different, fresh content. As far as I can tell, there are two posts each day. Again, I’m not on Instagram, but thought it was interesting that the post said “Link in profile” (bottom image). This is probably so that the post isn’t too cluttered. Each post has at least one hashtag. The Google+ account isn’t updated as often as the aforementioned pages. This could be because Anthropologie only has about 310,000 followers on this platform whereas its Facebook has over 1 million and Twitter has 518,000. However, its Instagram page has the most followers with 1.2 million! This was a surprise to me, but I guess it shouldn’t be after learning about Instagram last week and mobile. On all these pages, the website link is in the About section along with the tagline: “apparel. home. found.” Not really sure what this means, but there is definitely consistency across all these platforms. 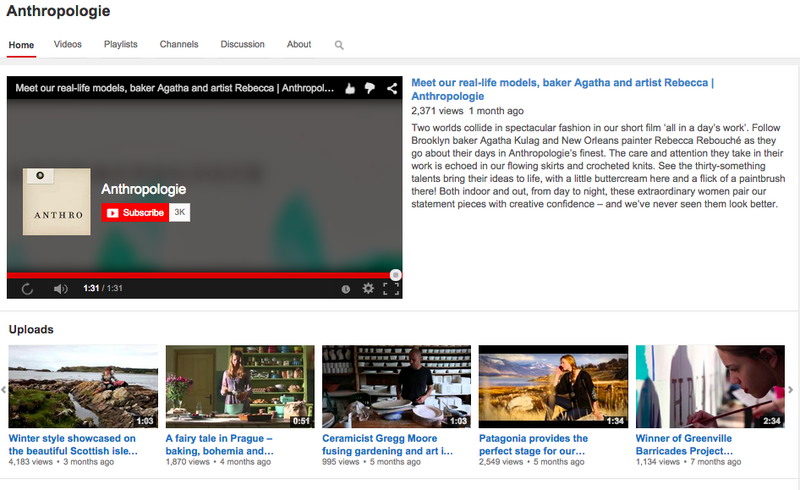 Anthropologie’s YouTube is updated with a new video at least once a month, which is great. There are a variety of videos of its models and designers, photoshoots and travels around the world. The company also has a Vimeo with most of the same videos. It’s hard to tell how often the Pinterest is used, but the company has 60 boards and 6,753 pins. I think Anthropologie does IMC quite well. The company really promotes its website and tries to drive users to it by giving the link to the site in the post or telling users where they can find the link if the platform isn’t conducive to that. It also uses hashtags to engage users with the brand and each other if they share a love of the company. Anthropologie tries to update each site every day or at least often. None of the social media pages were outdated. 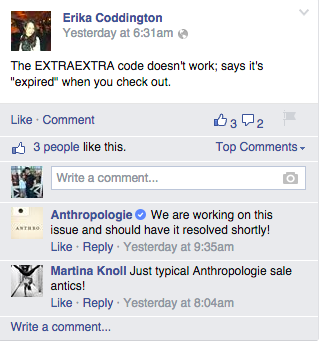 Vicki Klemstein of Ciceron, as well as a few others, agrees that Anthropologie does IMC right (2014). On the other hand, Burberry doesn’t do IMC very well. On the website, I could not find links to its social media or how customers could sign up for emails. These features do not seem to exist, which I find quite strange. It would be very easy to add social buttons on the top bar or along the side menu. Perhaps this wouldn’t be keeping with the “distinctly British attitude.” After some research, you have to “Register” in order to receive emails. I think this is a bad idea. Personally, I always try to avoid registering on any website because it’s hard to keep track of all my different accounts whereas just entering your email address is fine, as long as you’re OK with receiving yet another email in your inbox. During the registration process, you can opt to sign up for email updates, but only if you want. Burberry seems to make everything extremely difficult. The website also hosts what I see as a hybrid between a blog and an Instagram. The page is called Art of the Trench, which simply has pictures of people in their Burberry trench coats “in any colour, any style . . . in all weather.” I think Burberry should make an Instagram and transfer this page onto that platform where it would do very well and get a lot more exposure. The trench coat is its bestseller after all and what its known for. If anyone has anything Burberry, it’s probably the iconic trench coat — or maybe the signature scarf because it’s cheaper. The only reason I found the page was when I went to Burberry’s Facebook About section, it provided the link to this page and the company’s other social media. Burberry has Facebook, Google+, Twitter and YouTube pages. The Facebook page seems to be updated once a day or once every couple days. It’s definitely not as active as it could be on this channel because it does have just more than 18 million likes. There’s also neither a box where I can see what users have posted on its wall nor a review box to see how users rate the brand or customer service. Also sometimes the posts have links to Burberry’s website, while others do not. And sometimes there are even posts with links to the Facebook page, which is puzzling because you would be reading the post at that URL. Burberry should always provide the website link in all posts to direct traffic there. The Google+ page looks almost identical to the Facebook page in terms of frequency of posts and the exact same cover photo. There is definitely a consistent image across all these platforms, but it’s boring to see all the same content. However, Twitter seems to be where the action is. With 3.6 million followers, Burberry tweets several times a day, always including at least one hashtag. London Fashion Week, #LFW, is coming up so a lot of posts have to do with that event. Despite the number of followers, the posts aren’t getting a lot of interaction. Burberry isn’t retweeting either. So, apparently Burberry does have an Instagram, just stumbled upon it. It wasn’t listed along with the other social media on its Facebook page. Obviously, not a lot of communication going on. All of the posts are the same as its Facebook and Twitter pages, no new content. Every post does have at least the #Burberry hashtag. It doesn’t have the link to the website on its profile page either, which it should have. Burberry’s Instagram has fewer followers than Twitter with 2.7 million, but there is more interaction as many posts have thousands of likes, i.e., a post of Beyonce and JayZ got 68,000 likes. However, the interaction seems to be one way as Burberry is only following 121 users. Also just found its Pinterest. This is what happens when you don’t clearly display your social media pages. Lastly, Burberry has a YouTube page that is surprisingly populated with videos from “Burberry Beauty” to “Burberry Shows.” The company’s YouTube and Twitter pages seem to have the most unique content. At some point, I’m definitely going to explore the YouTube page because there are a lot of different videos. It’s pretty obvious that Burberry needs some help in the way of IMC. Not having social buttons and an easy way to subscribe to emails are definite no-nos. There is a consistent image across all platforms, yet the posts were identical across some of them, which I don’t think is necessarily good either. Burberry needs to include its URL in more places to drive users to the website as well as update its content more often. This is interesting because my age group probably can’t afford most of Burberry’s products. It’s great that the company is using social media to reach this demographic, but I think it needs to do more in order to achieve an IMC plan. For my last brand, I’m going to look at Godiva because I love chocolate, of course. 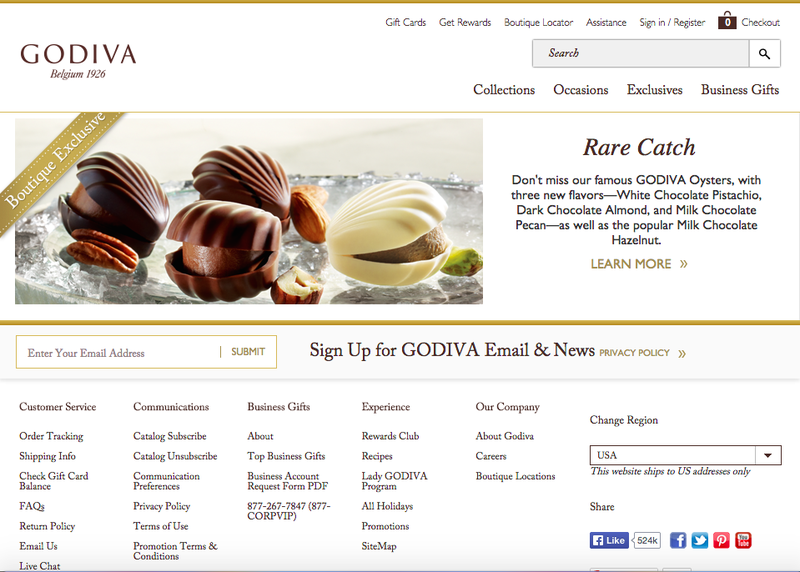 I really like Godiva’s website — it’s extremely easy to navigate. At the top of the page, you can see the different promotions going on. Right now Godiva is offering free shipping for purchases more than $65 and there is also a sale with items up to 40 percent off. As pictured above, the footer contains all the the links you’ll ever need: You can sign up to receive emails, request a catalog, join the Rewards Club or the Lady GODIVA Program, learn more about the company and head to its social media pages. There is also a link that will take you to a recipes page. It seems like this is a quasi-blog, but it’s probably not updated as often as a blog might be. Currently, two of the recipes say “Just added” so this lets people know what’s new. Godiva has Facebook, Twitter, Pinterest, YouTube and Google+ accounts. Godiva’s Facebook is updated a couple of times every day. Every post has a picture or video and a link to the website (yes!). There is also a link to the Pinterest page, which isn’t working as of now, so that definitely needs to be fixed. There is also a link to enter the Godiva Sweepstakes, but this ended last year so the company should either get rid of this or start a new sweepstakes for users. The company seems to respond to every post that warrants one, such as help for customer service. Its Twitter has some of the same posts as Facebook, but new content as well. The company does use hashtags, but doesn’t always include the link to its website. Godiva also seems to interact with a lot of different people on this platform. It retweets posts from customers as well as other companies when it’s relevant. Some tweets also direct users to its Facebook page or Instagram to get users to connect with them on these different platforms. All of these pages have the website link in the About section. Godiva has a Google+ too, which it updates less often than Facebook or Twitter. Similar to the past two brands, the company has the fewest followers on this site, but it’s easy to add this site to your social media routine. When you update your Facebook, update your Google+ as well and share a couple of other users’ posts — it will take only a minute or two. The Google+ page is how I found out about the company’s Tumblr. Not sure how to get to the blog from the website though. The company posts once every couple days it seems like, many of the same images as its social media pages. But it includes hashtags in every post to allow users to easily search the company and its products. I think the company should add the recipes page on its website to this blog and perhaps have some of its chocolatiers post entries. 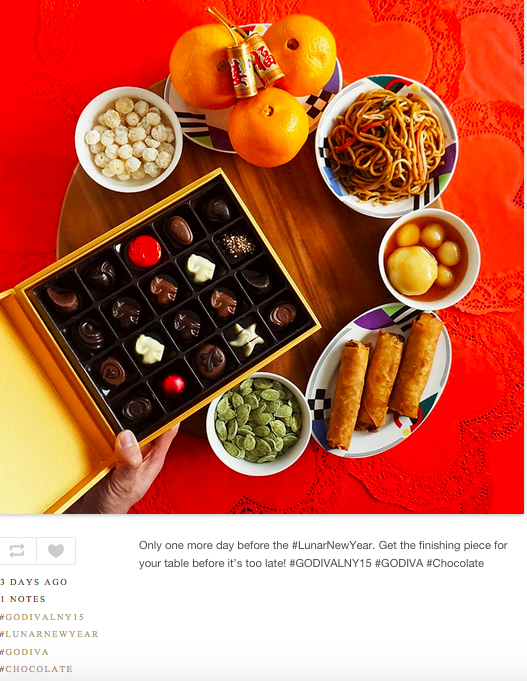 Godiva has the most followers on its Instagram account, yet it doesn’t have this site listed on its website. Regardless, I really like what Godiva does on its main profile: “GODIVA Chocolatier, Inc., is a global leader in premium chocolate. Tag your #chocolate photos with #GODIVA http://www.godiva.com/GameOverGameOn.” This provides followers with the link to the website and encourages them to use the Godiva hashtag for engagement. I guess it seems intuitive, but none of the other companies explicitly said that. Only problem is that link doesn’t work either…Godiva posts at least once a day, if not a few times, and in these posts, includes about three hashtags and sometimes posts @ some of its followers. Godiva’s Pinterest has 30 boards, but not that many followers. I think one of the problems seems to be it’s not saying in the caption where the photo came from all of the time to drive traffic back to its Pinterest or website. On its YouTube page, Godiva seems to post a few videos all at once and then none for months at a time. In the video captions, the company includes the website link as well as hashtags. I would say Godiva does IMC somewhat well, in between Anthropologie and Burberry. There is consistent messaging and imagery across all platforms. Most of the content is up to date. The company includes links in the content to its other pages, but as I found out, some of these links don’t work. Hashtags are used across all these different platforms to make the company and its products easily searchable. One of my main grievances with Godiva, and Burberry, is that it doesn’t clearly list all of its social media pages on the website. For example, I just happened to stumble upon the company’s Instagram and blog. If Godiva did this, it might see more traffic on these sites. Now I might go make this delicious looking Triple Layer Godiva Dream Cheesecake. Until next time!